Improvised Smoker? For Creating Smokey Infused Oils! For Cooking! No Really!!! 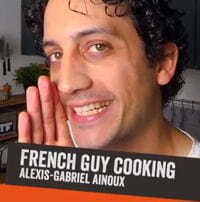 Alex over at French Guy Cooking, is one of the funniest and cool cooking shows on youtube you can actually learn things from. I found his channel awhile back from Jamie Olivers Food Tube Network and I've been watching ever since. Recently Alex's has taken up trying to cook the best "brick oven traditional pizza" he can using only his home stove. The first few videos are of him making a pizza peel, then various ways to configure your oven for that char on the bottom airy pizza crust you can only get by a 800+ degree oven, etc. Well as a bonus video to this series Alex just release a video about how to make a quick infused oil using a few items around the house as the "smoker" hehe. Check out the video below and don't forget to head over and subscribe to Alex's youtube channel!